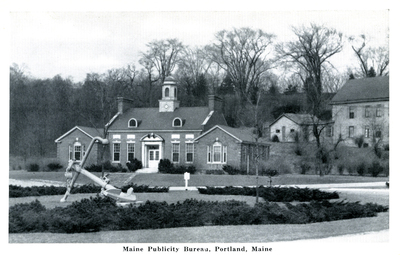 "Maine Publicity Bureau, Portland, Maine"
Full exterior view of Maine Publicity Bureau (3 Saint John Street), from southwest. Rotary and anchor memorial in foreground. Circa 1950s. on "Natural Finish" card made by Graycraft Card Company, Danville, Va.
"Maine Publicity Bureau, Portland, Maine" (2013). Portland Postcards. 30.